Successfully Added Motorized 1-Din Car DVD Player - 5.3 Inch Screen + Subwoofer Out to your Shopping Cart. Cool design Single Din Car DVD Player, with a fully motorized 5.3 Inch TFT LCD drop down front panel with touch screen function, and Subwoofer Output, letting you play your music or movies with super bass quality. Added to this is a built in Dolby Digital Decoder for even more sound quality, resolution at 1440x234 rear view camera Input, and even a DVD memory function which will remember the last position your DVD was when you play it again. 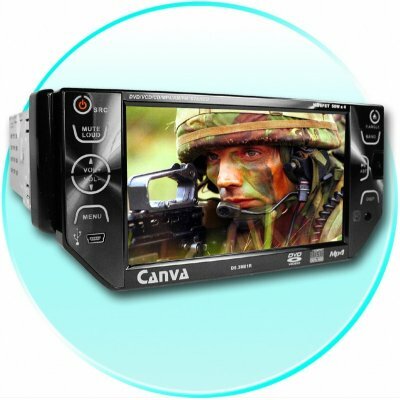 If you want even more features, Chinavasion also offers this high end Car Media Center with a SD Card Reader and a USB port, letting you bring your digital media with you as you drive. A wholesale priced item which will bring you Car Media to life, and available, as always, with Chinavasions no MOQ policy and friendly customer service..